The Inner West. Sydney’s heartland. A melting pot of global cuisine and culture. A mixture of Australia and the world. From back alley cafes to booming pub scenes, sports fields and scenery to hidden gems that only the locals know. All this and more on your door step so what’s holding you back? If the answer is back or neck pain and discomfort then you need to turn to Sydney Wide Chiropractic to provide the vitality and wellness you deserve. 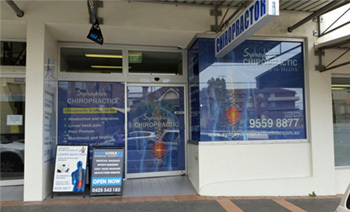 For the last 11 years we have been the leading chiropractor in the Inner West, offering safe and effective treatment solutions to a wide variety of clients who have been experiencing pain that has hampered their quality of life. The majority of symptoms are caused by manageable and solvable situations that our team of experienced and trustworthy staff can aid you with. The reality is that modern life is fast paced and the stress associated with maintaining a healthy work-life balance can wear you down. However, a visit to us, as the number one chiropractor in the Inner West, can provide the change you deserve, and return a healthy posture, fully functional nervous system and higher quality of life that you have been lacking. An imbalance of nerves through your spine can seriously affect your quality of life. When left untreated these spinal misalignments can obstruct your natural movement and result in long term chronic pain. Fortunately, our skillful team of highly educated specialists understand the importance of finding balance between good, effective and affordable chiropractic care in a management package suited to your specific requirements. We’re devoted to assisting you when it comes to your health goals, we don’t just provide straight forward chiropractic care but walk with you on the journey to better health every step of the way. So if you’re ready to take the first step towards a life of renewed energy and vitality then call us on (02) 9559 8877 or email us at info@sydneychiropracticclinic.com.au and book a treatment today.